In very late 1962, and not really appearing until 1963, came the revised version of the RAC Land Rover. 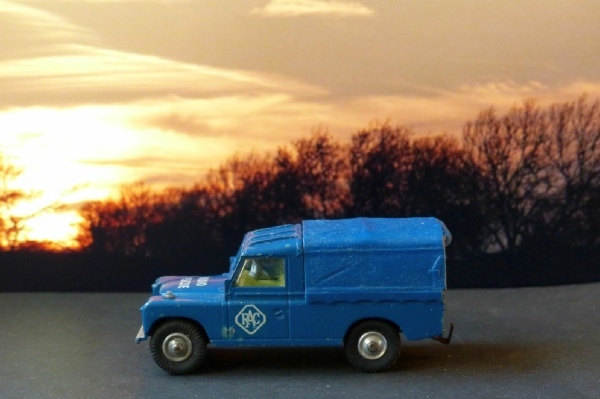 The Corgi models based on the old Land Rover were all updated to the later type with seats and suspension. This was not around long and is quite scarce. Not as scarce as the RAF one, 351S, but still not that easy to find so you need to get what you can whenever you can with these. This one is nice and clean and has what look like they must be original transfers, although they are a white colour rather than the cream of another model. The paintwork is very good - just small missing bits on the usual roof raised bits and there is some discolouration on the front wing. Sometime it would benefit from a replacement aerial the old one now just being a stump. The canopy in these pictures has been supplied with another example. A replacement is being supplied and the price includes this.